For more than five decades now, Roger Angell has worked at the hallowed New Yorker magazine. And during that time, as Sridhar Pappu points out in an elegantly written profile for Women's Wear Daily (also known as the bible of fashion), Angell has edited fiction and non-fiction while also publishing his own light-verse poems, short stories, profiles, and other features in the New Yorker's pages. 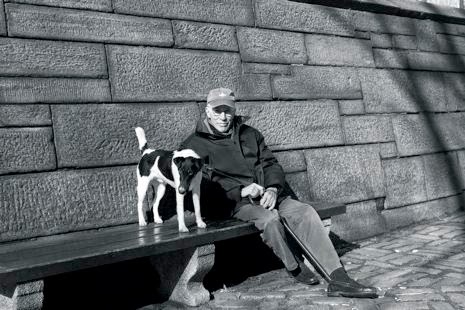 ROGER ANGELL WITH HIS FOX TERRIER, ANDY. A few months ago, Angell made news on his own when he wrote a piece for the New Yorker that, as Pappu says in the profile, "managed to cut through the noise, becoming a subject of conversation at Manhattan cocktail parties and in Brooklyn bars while also generating thousands of tweets and more than 40,000 Facebook shares". Read Angell's marvellous essay in its entirety here: "This Old Man". And check out the profile written by Sridhar Pappu here: "Roger Angell: A Hall-of-Famer at 93". *The writers Angell has edited include Woody Allen and John Updike. Back in June 2000, Sridhar Pappu had written an essay for Salon about his "experience with the new world of high-stakes Indian American dating". Read it here: "Deranged marriage". ALSO READ: In the New Yorker — "Citizens Jain: Why India's newspaper industry is thriving"
What a zinger of an opening line! Reminds you of Charles Dickens (classics) and Raymond Chandler (non-fiction). What is it about words that can stop you in your tracks no matter what you are doing? Opening lines was actually a topic for debate at the recent Emirates Literature Festival in Dubai and almost all the authors agreed that an opening lines makes all the difference between picking up or dropping a book. Perhaps you should invite your students to offer the best opening lines they have read... and the worst.